After nearly three years since Morgan’s first court hearing (August 2011), the Netherlands High Court (Raad van State) in Amsterdam published their verdict (Judge’s decision) about her, on the 23 April 2014. The verdict was written in Dutch, however, we have also had the verdict translated into English (and verified as an accurate translation by a Court-approved company). (2) The transport out of the Netherlands (from Dolfinarium Harderwijk) to Spain (Loro Parque) of Morgan. Sadly, for Morgan, the verdict was not in her favour. (2) transported to Loro Parque. However; Please note that although the ruling was against Morgan’s freedom, we believe that there are a number of aspects that were overlooked or not considered. Furthermore, we believe that there was (and still is) reason to believe that Morgan’s case should be investigated further. For instance, the Dutch Court decided that the evidence regarding the horrific situation in captivity, for Morgan (such as her self-mutilation), was not relevant to the case. This was despite the fact that Morgan had also been brutally attacked by the other orca kept at Loro Parque (when earlier, ‘socialisation’ was considered a priority by the captivity industry and the Dutch Courts, for moving her). Additionally, strong evidence showed that Loro Parque was not conducting current ‘Scientific Research’ to preserve the species in the wild. This was important to note as it was, erroneously, the main basis for the legal reasoning to move Morgan to that facility. The Dutch court also ruled that the updated evidence from four of the seven experts (who all had wild orca experience; i.e., Dr’s Ford, Guinet, Lockyear and Ugarte), would be totally disregarded. This was despite the fact that these four scientists withdrew their support for Morgan to go to Loro Parque, and rather had alternatively suggested rehabilitation and possible release or holding in a seapen. Perhaps even more concerning is that we have uncovered evidence that clearly shows that the Courts were either not informed or were misinformed about a wide range of aspects. This included SeaWorld Entertainment, Inc.’s involvement in Morgan’s transfer to Loro Parque. Those who presented evidence for Dolfinarium Harderwjik and Loro Parque did so in a way that was misleading and contributed to the confusion that plagued both the Court and the Dutch Government throughout the proceedings. They (the three theme parks) also deliberately avoided answering questions that were of vital importance to the case (such as the ownership of Morgan and the commercial nature of any transactions that had eventuated). Despite Morgan’s lawyer repeatedly asking for ownership to be clarified, the Court never looked into it, which has proved to be a big issue, given that an orca is valued at between US$10-20 million and it is illegal to trade or sell a wild-born orca (which is a CITES listed Appendix II, Annex A species) in the EU. Tellingly, SeaWorld Entertainment Inc. at no point was present in the Netherlands Court cases regarding Morgan, yet they claimed ownership of Morgan at some stage during this process (however, just when this transaction occurred is not yet clear). SeaWorld Entertainment, Inc., listed Morgan as an asset (i.e., owned by them) in their legal description of the company on 27 December 2012 (page 74), whilst the Court proceedings in the Netherlands were still under way. This too is in violation of the legal protection that Morgan was afforded under EU law. After nearly a year of delving into the intricacies of this situation we have revealed a wide range of errors that revolved around the two Court cases (and three hearings) for Morgan. 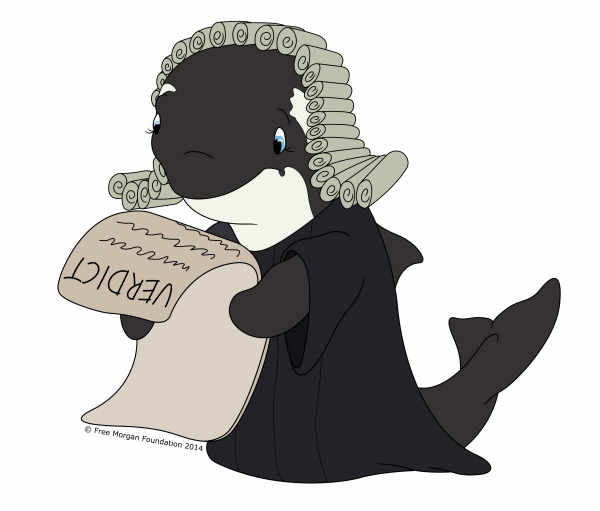 Therefore, it is vital that the verdict be read in the context of the 2015 document known as the Morgan White Paper on Whale Laundering (also known by its more formal title of “CITES and the Marine Mammal Protection Act: Comity and Conflict at Loro Parque”) in which we have exposed the process of whale laundering, the multiple layers of negligence, as well as duplicitous behaviours of some of the involved parties.